The following is one more experience that I want to share with you from my recent visit to my holy-land, INDIA. Every smoker who had to travel for a long time in air, waits patiently for that taste of smoke at next stop. I am not an exception. Most of my air travel segments were uneventful but this one incident was different. Me: Do you speak English? At 100 ft distance there is a smoking oasis. After having my first smoke after 9 hrs, this happy soul was back to flight. After nine more hrs of fag-fasting flight to Mumbai and a safe landing, I was excited because a) I am in India, my motherland and, b) I will find a way to smoke. I had to transit from international arrivals to domestic departures by bus. At domestic airport everyone started rushing-in, but I looked for a place in an open area to smoke. I wanted to ask someone there before I lighted the cigarette. I asked a passer-by security guard walking away from me if it was OK to smoke here. That guard ignored me or could not hear me. I took my chances and lit my smoke and I saw the same guard with a gun (think Ak-47) running towards me with a real harsh face. I do not speak Hindi, but I can understand. Guard: Put down the cigarette!!! Me: I was really tired and in that pissed off situation, I lost my voice. G: How dare you to smoke in airport! 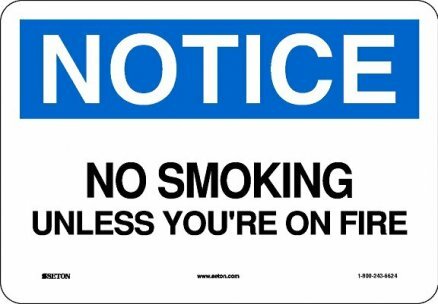 It’s a smoke free zone! M: I am sorry, I am returning after 3 yrs and I thought its allowed outside. G: Come with me and you will be fined and I need to talk to My manager. M: Relaxed by then and walked with him inside the airport. Inside, there was one stronger guard with a gun and looking at me with a wicked smile. I was thinking that I will be starting my first day in the Holy-land with a bribe. Then the manager came and asked me ‘why did you do you this?’ and I explained that ‘I am not aware of the rules here since I am back after few years. I am sorry for what I did and ready to pay the fine’. Manager wanted the guard to get satisfied and I looked at the guard and said. ”I am really sorry for what had happened and I am ready to pay the fine” rather than offering him some money. He was probably still thinking about his options. Then the manager wanted me to rush to the gate since I need to get a transit flight to Hyderabad. Thank GOD! I am out of there. I was happy, super happy.